For Porter's big 5th birthday party this year, he choose a super hero theme and we ran with the idea. After lots of fun creative work, a bit of stressful list making and a fair amount of last minute scrambling, it all came together quite nicely for a fun time in the park today. The trainees all arrived full of good spirit and energy to undertake their super hero studies. We had a menu of yummy snacks, carefully chosen by Porter. Porter's tongue cannot stay in his mouth if he is concentrating. The first task at hand was batarang practice. We made these cardboard batarangs and then mounted some villainous characters on the balloons for target practice. It turns out cardboard batarangs can work well enough to pop a balloon, as one skillful trainee discovered. Thankfully the only attendee that was whacked in the face by an errant batarang was an adult who suffered no injury. Yikes! Next up after the batarang toss, was a Kryptonite find. We did our best to protect Superman from the dangerous Kryptonite (aka gravel painted bright green). I am sure many parents still have some rocks in their purse, as most kids asked the take their find home. An obstacle course was the real centerpiece of our training today. First a dash through the tire obstacle, followed by a crawl through the blue tunnel. A light breeze kept blowing the tunnel away down the lawn, which made for a greater challenge as kids were trying to crawl into a moving target often! Then, the kids got to hone their skills with a walk across the balance beam. The final obstacle was crawling under this dangerous field of lasers! As a totally unplanned bonus, some random family at the park had this giant inflatable ball they were rolling down the hill in. They were amazingly tolerant of our intrigued crowd and graciously hosted dozens of trips down the hill. 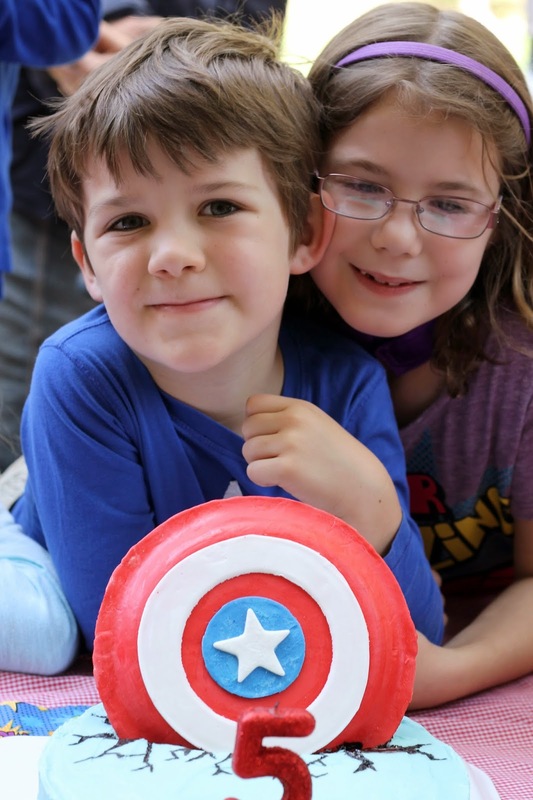 For cake fun this year, I practiced my skills with fondant again and made a Captain America shield to "crack" the cake. Rather than wrestle with a large cake, I decided to just make a regular sized one and add on cupcakes to have enough treats to feed the hoards. My 5 year old boy! He had a super day. For days now Porter has been keeping tabs on this fondant shield as it dried in the kitchen. He was very excited to finally sample it. After a few bites he started sharing it around with everyone. It seemed like some sort of super hero communion as the kids each took a bit off to partake. Phew. Super fun, but I feel bad for poor Tim who has his birthday next week. I totally love pulling these parties together, but I think all my birthday steam is gone for a moment.